CMTS are the Australian Distributors’ for DERATECH Sheetmetal Products. DERATECH – Belgium is an integrated professional company that has been committed to R&D, production and sales of Sheetmetal equipment. Adhering to the European design philosophy, quality, efficiency, stability and reliability are core values of DERATECH. Branches of DERATECH – Belgium have so far been established in Germany, Netherlands, Australia, China, Thailand and Malaysia, while DERATECH products and services can be found throughout the world. DERATECH provides the best value for your investment by means of price, delivery, quality, training and after-sales technical support. Supporting their customers with successful and efficient realization of their projects, DERATECH offers its clients complete customized solutions for their sheet metal working requirements. 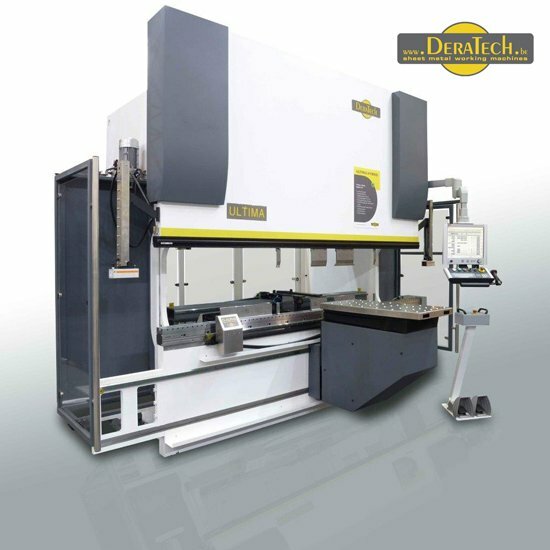 DERATECH along with CMTS SHEETMETAL MACHINES main aim is to provide excellence in sales and service, to build upon a good reputation, which provides the key elements for guaranteed further recommendation. It is equipped with 5 axes (Y1/Y2,X,R,V ) optional to 11 axes. The high precision digital encoders at both side of the machine continuously measure the movement and position of the upper beam. ESA 550 controls is a 2D/3d graphical windows based controller with a 17” or optional 19” touch screen. Heavily built, rigid, precision back gauge on ball screws with linear guiding insures fast and precise positioning,. Front support arms on a linear guide ensure optimum product support during bending. High quality German hydraulic system with high frequency positioning valves. 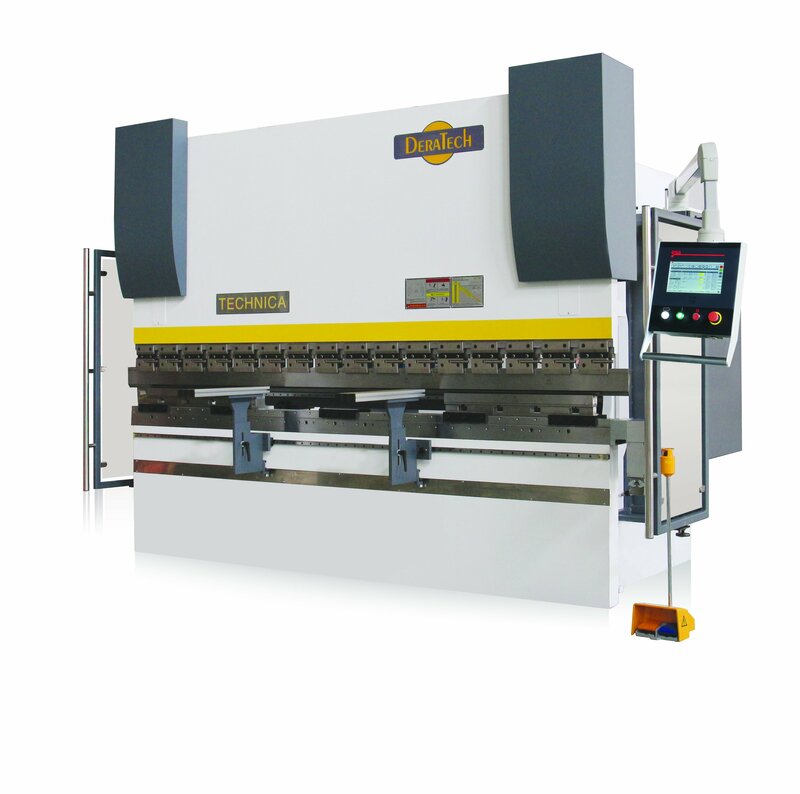 Smooth running of the machine is achieved with high speed machine operation. 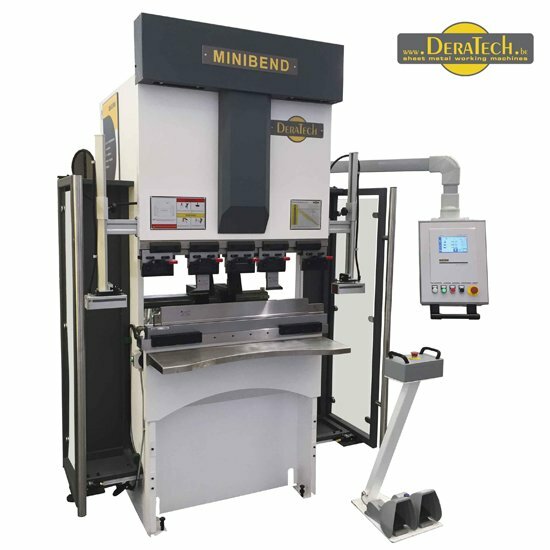 The MiniBend is a good example of a efficient interaction between operator and machine. By proving the best working conditions to the operator and creating a user friendly environment, this will result in outstanding productivity at every stage of the job. 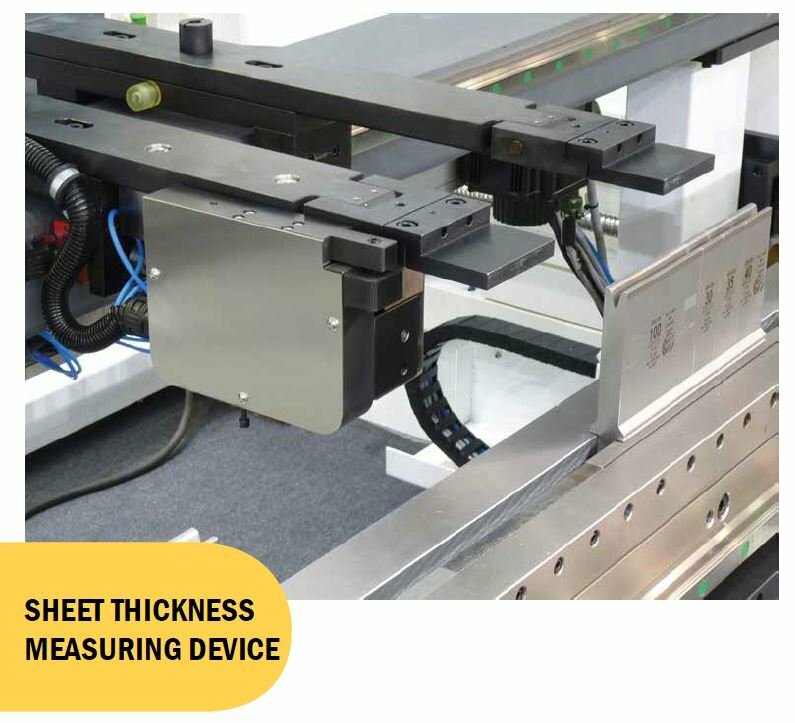 The Automatic Sheet Measuring D-ASM is a sheet thickness measuring system which is integrated in with the back gauge finger. The D-ASM measures the sheet thickness to an accuracy of +-0.01mm, applicable up to 20mm of material thickness. The measuring cycle takes only tenths of a second, the measured data will be send in real time to CNC and the bending program will be adjusted.